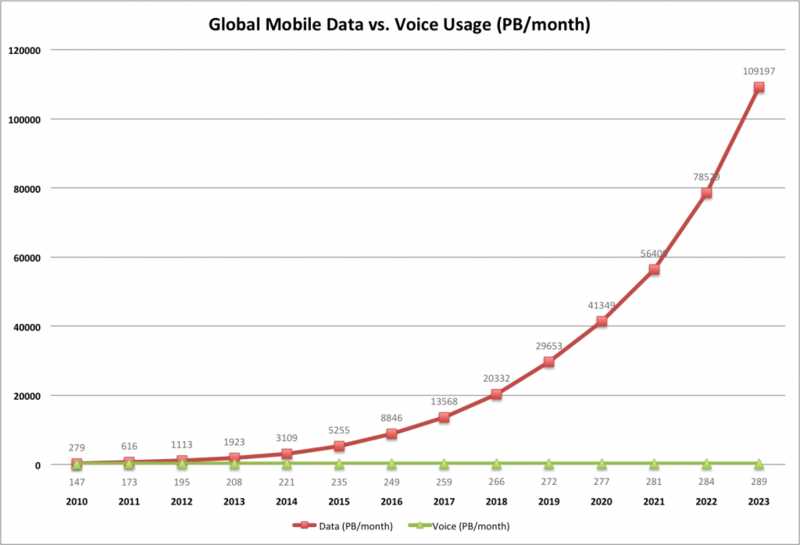 ASK: Looking for a visualization of mobile voice/text usage compared with data usage. 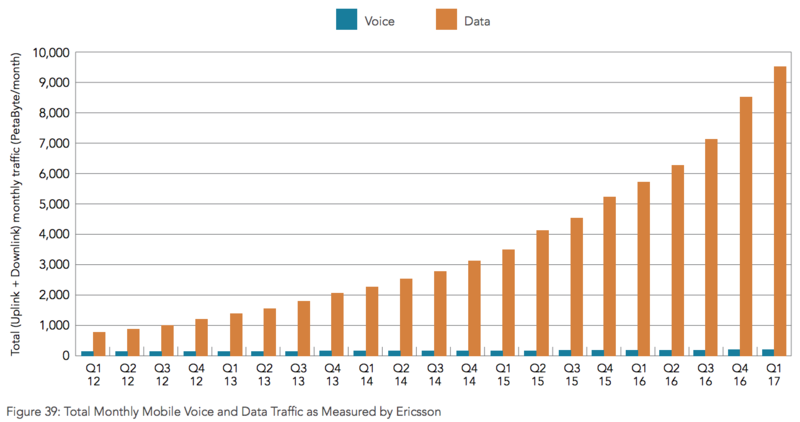 Mobile data traffic has continued to grow, and Figure 39 shows total global monthly data and voice traffic from the first quarter of 2012 to the first quarter of 2017. It depicts a continued strong increase in data traffic, with voice traffic growth having diminished to the low single digits per year. The growth in data traffic is being driven both by increased smartphone subscriptions and a continued increase in average data volume per subscription, fueled primarily by increased viewing of video content. In the first quarter of 2017, data traffic grew nearly 12% quarter-over-quarter and nearly 70% year-over-year. Looking at the full five-year period shown in Figure 39, cumulative voice traffic growth was 28%, while cumulative data traffic growth was more than 1,200%. Video now accounts for over 50 percent of all mobile traffic – a figure that is expected to increase to over 75 percent by the end of 2023. A recent survey* of consumers aware of VR in 8 countries suggested that 7 out of 10 early adopters expect VR/AR to fundamentally change everyday life. These early adopters expect 5G to play a significant role in enriching the shared VR experience by providing lower latencies, haptic feedback and higher resolutions. In its current forms, AR may be much more suited than VR to mobile applications. However, the line between the two is already dissolving, with merged reality (MR), stereoscopic six degrees of freedom (6DoF) and holographic video on the horizon.